Posted on Nov 18, 2011 by Appleton Downtown Inc. The Business Club Center, Downtown Appleton, offers furnished, business-ready office spaces that are turn-key and move-in ready. Unlike most traditional office rentals, your business can be up and running the moment you walk in. You can have an office space starting at $350 per month (all inclusive, no additional costs). 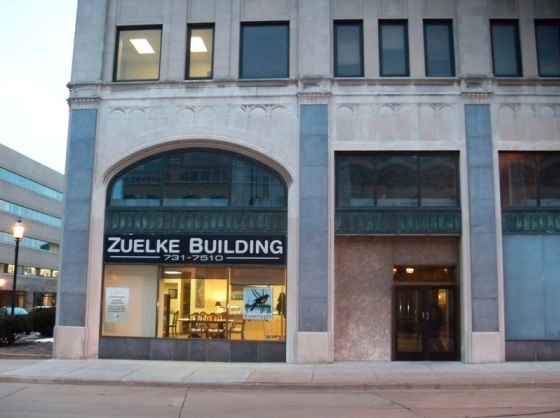 Completely furnished office space in the historical Zuelke Building, second floor, Suite 207, Downtown Appleton. What do you get for $350 ? An Office Desk and Chair. Free use of the Conference Room. Free use of the Meeting Room. Free use the Business Lounge. Free High Speed Internet (fiber). Do I need to pay extra ? No, there are no hidden cost. Prices include, heat, airco, gas, water, taxes and so on. Do I need to sign a contract for 2 or 3 years ? You pay per month and we expect you give us 1 month notice if you don't want to use the office space anymore. We don't put you in the basement and our office has a lot of windows and provide a lot of daylight !! Call 920-264-9474 and schedule an appointment today.